Chef de Cuisine James Seyba snagging a scoobie snack. Snap, crackle, pop! 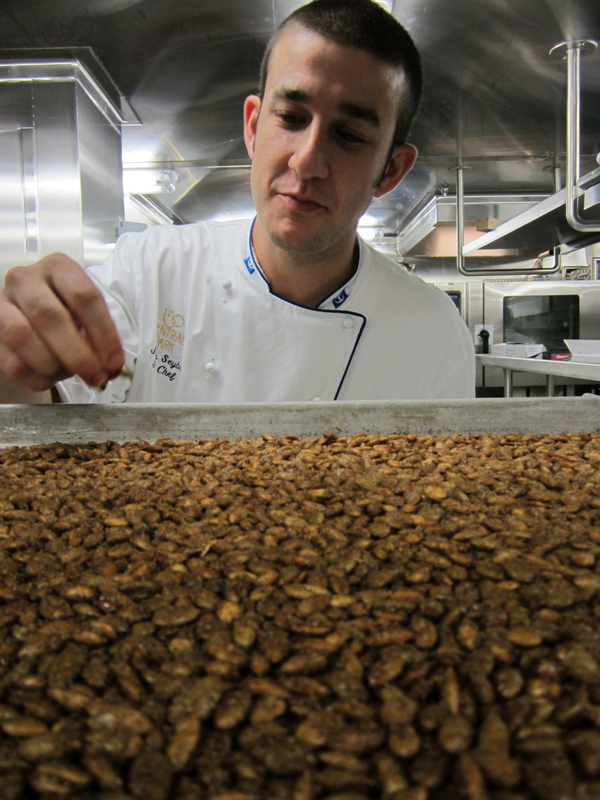 It’s not Rice Crispies, but Jamie’s warm spiced pumpkin seeds, fresh from the oven in his 150 Central Park galley — a Hedy Goldsmith recipe! After four delicious nights serving the first of Michael’s debut farm-to-ship menus, the “Farmstead,” aboard the Oasis of the Seas, “Greenhouse” rolled out yesterday and will run through our last dinner service tomorrow night before we arrive back in Port Everglades on Saturday morning. The pair will continue to cycle with each sailing through the end of the year, when our next set of seasonal menus (still in development) adding Teena’s Pride produce will roll out. Greenhouse’s second course is a velvety, sweet-from-the-squash kabocha soup with spicy chorizo, pumpkin seed oil, Swank Farms watercress, and the kicker — spiced, toasted pumpkin seeds. I caught Jamie making them yesterday as his team was prepping for the changeover, and found it hard to stay away from the sheet pan, especially since they came fresh from the oven. The spice mix takes the ordinary toasted seeds up a notch, and we all agreed they could be great by themselves as bar snack, on salads… you name it. The best part is the recipe is super easy, so we wanted to share it here. It’s the restaurant quantity (makes a lot!) but it’s the holidays… Do a batch and store them in an airtight container on the counter for a couple weeks. If they last that long!